?A full description of the political and economic events leading to Canadian decimal coinage. ?the 1859 wide 9 over 8 cents. ?Volume I has 330 pages. 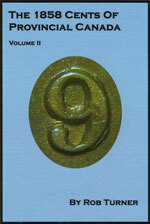 Volume II contains 136 pages. "Anyone interested in studying Victorian coins of any denomination would gain from reviewing the material presented here, both in content and in style." 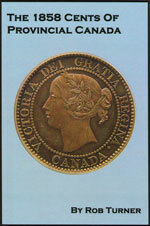 "Turner has elevated the bar in Canadian numismatic research." "From beginning to end this book is a quality production that will be a handsome addition to any numismatic library." Newspaper description For more than 35 years Canadian Coin News has been the definitive source for information about coin collecting and numismatics from a Canadian Perspective. You will find information on new and old issues, investment tips, current price trends and auction news and show listing across Canada. To order call: 1.800.408.0352. The Only Newsletter that reports Wholesale prices for Canadian Coins and Banknotes. The Canadian Coin Dealer Newsletter reports wholesale bid prices for Canadian coins, banknotes, and other related numismatic collectibles. The prices are a reflection of wholesale dealer to dealer transactions, or auction results. The bids reported within in no way reflect an offer by the Canadian Coin Dealer Newsletter to buy or sell the goods at the prices published. Subscription Rates: One Year - $74.90 CDN/$50.00U.S. Subscribers are guaranteed 12 issues. Le Premier magazine francophone pour les collectionneurs de monnaie et papier-monnaie. Dealer Listings, Club Listings, Price Guide and More! Click here for the ICCS Service Request Form. The Alternative in coin certification specializing in Canadian decimal and tokens. Copyright � 1997 - 2014 Torex� Coin Show & Auctions.